A recipe from Yotam Ottolenghi's Plenty book, simple and lovely, repeated here by popular request. Use the ripest, juiciest and sweetest tomatoes you can find, and serve it with fresh, crusty baguette. Start with the marinade - scatter the fennel seeds in a small frying pan and dry-roast until they begin to pop. Transfer to a pestle and mortar and crush roughly. Place the crushed seeds in a small bowl and add the remaining marinade ingredients. Break the mozzarella roughly with your hands. Smear it with the marinade and set aside for 15-30 minutes. 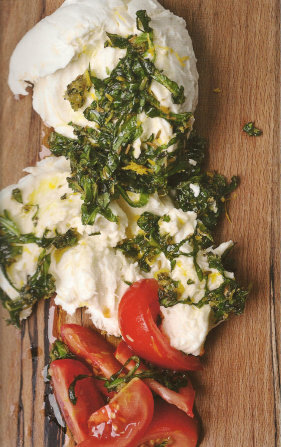 To serve, cut the tomatoes into wedges and plate along wiht the marinated mozzarella. Drizzle with extra olive oil and serve.